A great Welcome to our test plattform Nano Coatings Test. This is a german webpage, but we want to give you all the information about our product tests, so we translated all stuff to english if you can’t read german. So enjoy our articles and choose the best nano coat product for you. The nano technology is a big topic in the world of cleaning and it has a big future. Wether in the area of nano glass sealant or for cars, who invest the best technology for nano coating, invest in the lotus effect and thereby in the future as well. Fewer car washing, waxing and polishing are the results. Also the environmental Protection is a very great result. Important: Before you start with a Nano Coating you have to ensure that the nanoparticles can adhere. So you have to remove all types of oel, silicon and surfactants from the surfaces of the corresponding car, also no rests of dust, dirt and lime. If you just need the glass coating stuff, click here. The first Nano Coating product which self-assembled ceramic SI structures . CleanglaS is a highly developed nano-glass sealant / glass coating with the unbeatable instant lotus effect and anti-lime-deposit technology. Cleaning your glass surfaces like windows, showers, or even windshields has never been so easy! This means for you: You never have to clean the surfaces with a addional stuff. „Just use Cleanglase„. the destiny of Cleanglas is to revolutionize the Nano Coating and Nano Sealant. And it’s done 🙂 With cleanglas you have 2 x 30ml bottles with the nano coating stuff, a special sponge and stuff to remove the lime. It’s highly recommendable for car glasses , generall showers and windows. Currently they sell their new product for 67,95€ (normally 88,70€). By cleaning glasses no other product can beat the incredible cleanglass winner 2016. The revolution is perfect. This Hi-Tech nano-coating is applicable not only on glass but also on metal and plastic. The set with a great lotus effect includes a 125ml primer cleaner to preclean each surface and a bottle with 125ml nano-coating to coat all surfaces of a car or glass. Additionally the set includes 4 clothes (2 high quality microfiber), which you can use perfectly for the application and following cleaning. Our experiences were completely positive. The application is very easy and the effect is impressive and lasts for a lot of months. Nanotol from CeNano is a big nano-coating business in Germany with a lot positive ratings, all of the customers a very happy and satisfied with the products, which have the best price value. 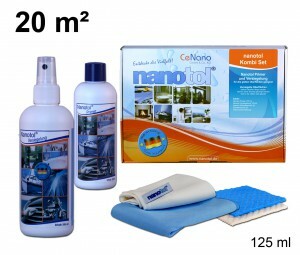 With this set, which Nanotol delivers here, you can clean and protect a car completely (paint, laque, carglass, chrome). Additionaly you can use it for you windows incl. frames in your house or your showerglass. There are bigger sets as well. 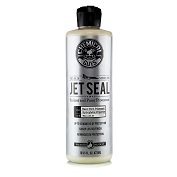 The Jetseal High-End Sealant is based completely on Nano technology and acutally developed for airplanes. Correspondely high-end-like is the coating for cars, aluminium, fiverglasses, varnish and chrome. 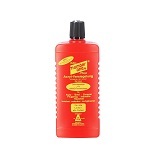 It’s a pure product to seal the varnish cars, boots or airplanes. You can’t clean a car with this one, but for sealing it’s done perfectly. Thereby we recommend Jetseal with a current price of 49,95€ just for sealing and coating but not for another handling. Heureka developed their Sealer concretely for glasses of cars, so it has a quite good water beading. Also if you drive with 70km/h you don’t need windshield wipers and you will have a nice vacation tour. All-In-One ? You have a primer to clean with a attached special sponge, a microfiber cloth and a 50ml bottle to coate your glasses on time. For 24,90€ (normally 39,99€) it’s a quite good offer and recommendable by us. This high-end Nano Coating product is developed for the using one time for motorbikes, but also for small cars, if you aren’t too wasteful. You have a 50ml nanotol primer, 50ml in bottle for coating and sealing varnish, chrome and rims. and 50ml nanotol 2in1 for syntetic substances like saddles. Little bottles with a big effect you can have for nice price of 19,99€. It’s our 5th place. Important Message: Our Top5 are with their price-performance very nice and high-end. The next coming 3 products passed our test, but we just reccomend because it’s alot of stuff for less money. The longtime Coating of the nano hybrid technology base is just suitable for new varnishes. The quality and cusomer experience is average. It’s a bit hard to use it and it has a price of 49€, so it just reached our place 6th. With Hamlet 7000 it’s not complikated to use a lot of stuff to seal surfaces. Unfortunately you can just buy the huge bottle in a combo with the corresponding nano glass sealant. If you want to seal or cloat a truck or a lot of varnish stuff whatever, this is the stuff which you need and you have a great offer. For all other the Hamelt is a bit to expensive so it reached just place number 6 in our test. The acryl-cloating with nano technology of „number-on“ is small, compact and you can it use for a lot of stuff. It’s usable for politure for a car, a caravan, a boot or a plane. Allthoug our test no was so great, since 10 years the customer buy it frequently. Therefor it reached our 8th place and with a offer of 10€ you can try it. A real recommendation you won’t get from us. How does a correct nano coating work ? If you want to coat or seal the vehicle without help of a expert, you have to note some stuff to reach the lotus effect, because this smoothness and the coresponding effect should defend rain water and dirt. Different products reach different results in varnish, glass or plastic. If you have some doubts ask your car workshop. A lot of workshops have nano cloating in their offer, so they can help with a lot of informations. First you have to clean the car or the surface completey. Check it after to investigate, you haven’t any rests of dirt or dust. If the temperature is over 25° C, you have to acelerate you moving. So just spray a small part and polish it immedately, because it’s not allowed to dry without polish. For the polish of glasse surfaces you get ever a specific sponge to clean. You can use it. With glasses you have to polish carefully and deeply because the results you can see more. Be careful to remove all the strips on the glasses. Nun aber zu unseren Top 5 Favoriten der manuellen Nanoversiegelung. Für das Projekt Nano Glasversiegelung müssen Sie hier rüber. Unsere neue Abteilung für den Bereich Nano Steinversiegelung finden Sie hier. It’s better to do a nano coating by your hands or with a epert workshop ? If you do the nano coating yourself, you save a lot of costs of cause. but you have to be careful to your car you the corresponding vanishes. With a nice nano seal by a workshop you have 2 years fun without do anything in this time. Additionally the expression nano no is protected, so a lot of businesses use their expression „nano“ for a lot of other stuff, which isn’t connected with the real nano technology. Additionally not ever you can see the problems immediatelly. Sometimes months later you can have a dust rest,which affect the varnisch or another surface, so if you want to be sure, use an expert workshop . If you search the best nano coating for you car, your boat or you plane, you reached the best adress here. Read the test and the compare stuff and you will have the best result for your future. If you do another test wth another result we are very curious for your results and your comments. Do you want a view in the science ? Actually the expression lotus effect comes from the word Lotos Effect. And this a flower which can pretend the rain to be not affected or influenced. The water goes down and the flower just take the water or the stuff, which it is needed, not more. It’s called Lotos flower, but other flower like cabbage or lady’s mantel have the same effekt. 1970 the lotus effect has been discoverd in relation of Self-Cleaning-Effects.Later in 1990 it was possible to transfer the effect to human technology and for products. Of cause the self-cleaning-effect of nano coating is very interesting and importance increases more and more. Thereby today it is a chemie-phyicale effect, which we use in commercial use of nano coating / sealing.